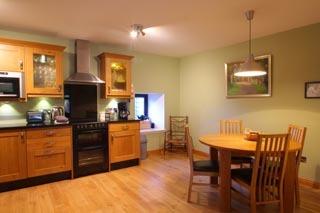 This stunning high quality conversion, with a beautifully designed interior, is an ideal house for families or couples. It is situated in a fabulous secluded woodland setting in the centre of Kinblethmont estate, with woodland walks and a walled garden containing a children's play area and garden games to keep the younger members of your party happy. There are lots of farms tracks and flat roads around the estate and the owners have a number of bicycles available for rental. The area is a perfect holiday destination with a wide variety of activities and amenities available for all ages. The spectacular beaches of Lunan Bay and the Montrose Basin are within easy driving distance and are a great treat, both in the summer and winter. If you are looking to play some golf then Letham Grange golf course is only a mile away and can be reached on foot. A short drive will take you to one of several excellent local courses and both the Championship courses of Carnoustie and St Andrews are less than an hour's drive. There are opportunities for both sea and river fishing, cycling, hillwalking, skiing in the winter at Glenshee and you can even learn to traction kite at Lunan Bay. The area is also rich in historic interest with Hospitalfield House 10 minutes away and Glamis Castle and Scone Palace both well worth a visit. The old fishing town of Arbroath is famous for its Arbroath smokies - wander down to the picturesque harbour and see them being hot smoked in the traditional way. The visitor centre at the impressive Arbroath Abbey explains the importance of the 14th century Declaration of Arbroath and how it has affected Scotland's history. There is a lot to see and do in Dundee, all year round; you can visit Captain Scott's Antarctic expedition ship Discovery, the Verdant Works, or McManus Galleries. Dundee also offers good restaurants, theatres and the Dundee Contemporary Arts centre for a taste of modern day culture. Kinblethmont is a beautiful estate and guests have acres to explore on foot or bicycle - and perhaps spot the red squirrels and deer who live here too! The entrance to the Stables is via a good sized porch area/utility room, coming off this is the separate downstairs WC. Off the porch is the large open plan living area with a beautiful modern kitchen with granite work surfaces, dishwasher and dining table at one end, at the other end is the sitting area. 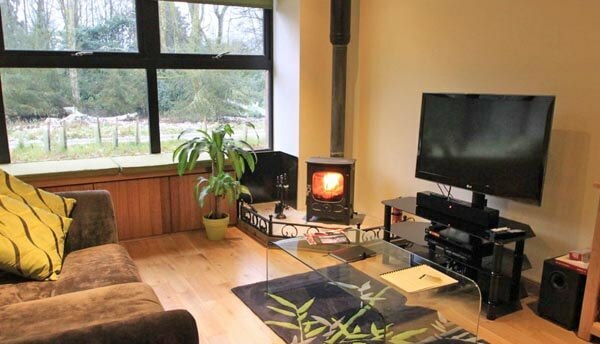 It has a large window looking out into natural woodland, 2 very comfy sofas, a large 3D TV and a cosy woodburning stove - perfect. Upstairs there are two spacious bedrooms both have solid oak furniture, plenty of wardrobe space and lovely comfortable beds. 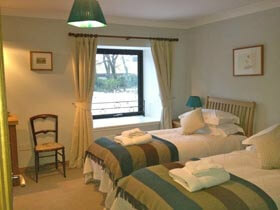 Both have stunning views out into the trees and woodlands. 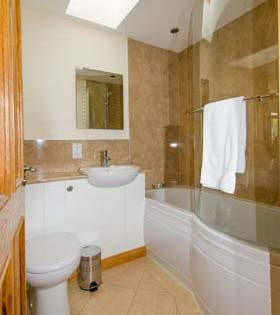 There is a shared bathroom with large bath with shower over - the bath is specially designed with a shower screen so that you can have a proper shower! The Stables is decorated in a cool contemporary style with original artworks from Kinblethmont Gallery and are kept cosy and warm with underfloor heating downstairs and radiators upstairs - all fuelled by woodchips from Kinblethmont estate. Outside there is plenty of parking and there are private patio and grassed garden areas which cannot be seen from Kinblethmont Coach House next door. 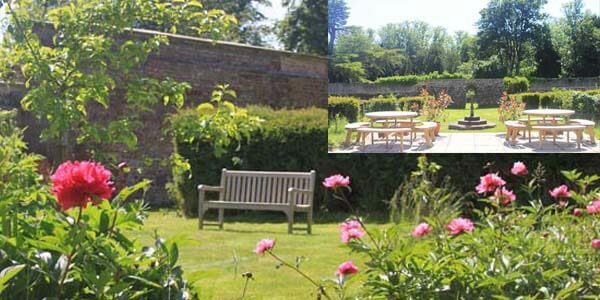 You can walk to the 2 acre walled garden which is beautifully sheltered and set up with a children's play area and various garden games or look out for squirrels and deer from the paths of Kinblethmont estate. From Arbroath take the A933 road to Brechin. At Colliston turn right before the church. Follow this road (signposted Letham Grange) to the T-junction. Turn left and then right into Kinblethmont Estate. Continue for about 1/2 mile along this road past the farm (and farm office and farm cottage sign), turn left at the sign that says 'Home Farm and Cottages' (about 1/2 mile). Take first turning on your right that says 'Kinblethmont Coach House and Stables'. The Stables is on the right. The other end of the building is the Coach House. Heating is included in the rental price. An initial supply of logs are provided. 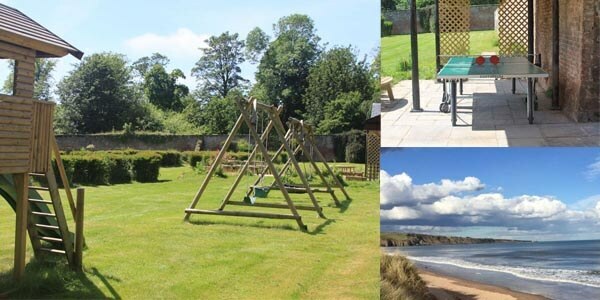 Use of Kinblethmont 2 acre walled garden with children's play area and garden games. The Stables is rented out year round. Change over day is Friday. Check in 3.30 pm, check out 10 am. 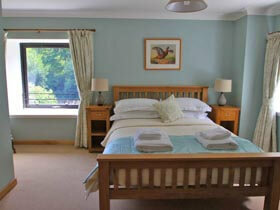 Short breaks available - not July and August. 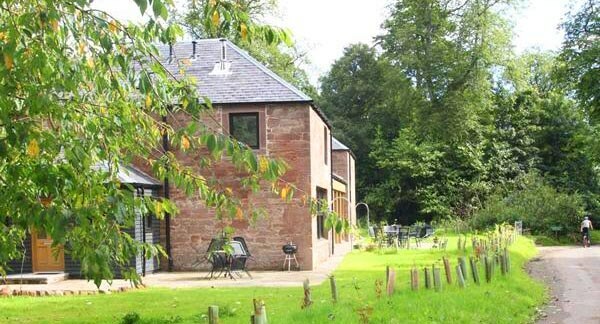 To book this stunning Angus self catering stables conversion, click the enquiry button below and see availability and rental rates. 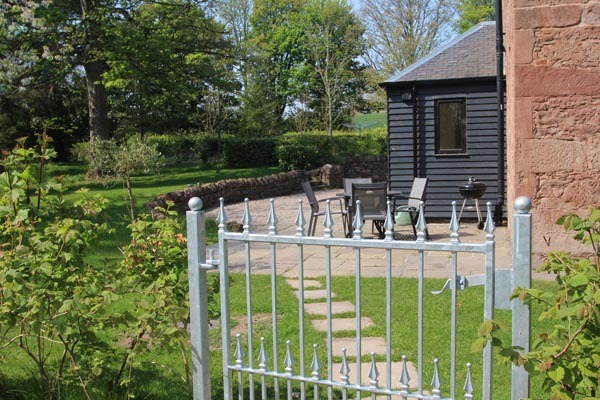 This delightful holiday cottage for 4 is perfect family self-catering accommodation in Scotland on a beautiful estate near to beaches, hills and golf courses. There is so much to do on the estate but if you want to explore further there's lots to see in Angus too. The delights of Fife, Perthshire, Dundee and Edinburgh are easily explored as well.